PAPER REVIEW: “Continuous quantification of HER2 expression by microfluidic precision immunofluorescence estimates HER2 gene amplification in breast cancer.” Scientific Reports, Nature. During the last decade, the analysis of solid tumors has evolved from primarily qualitative to increasingly quantitative. The outcome of classical tests was simply to assess whether the results were positive or negative for a specific marker. 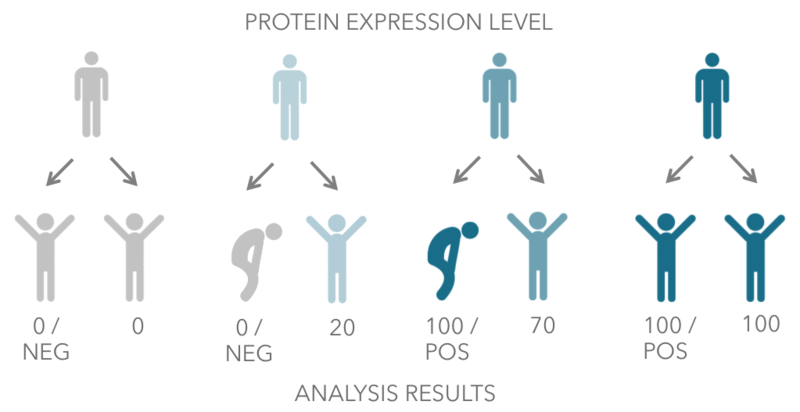 However, in recent times, doctors have started to see the value in quantifying the amount of protein expression. 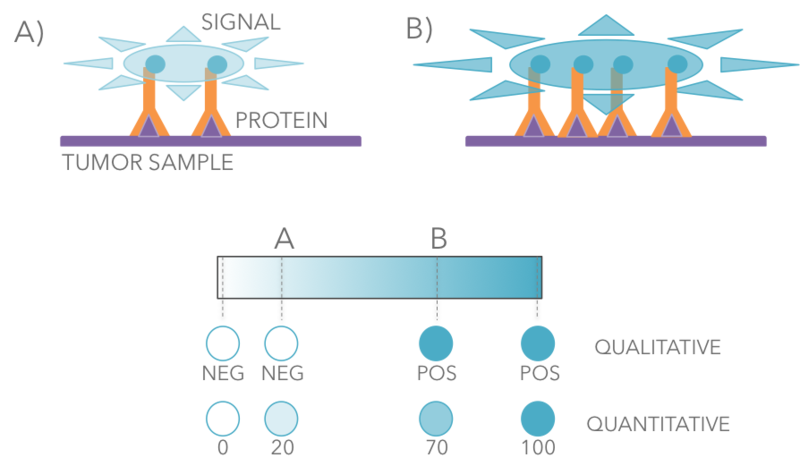 In this alternative approach, instead of establishing solely whether a tissue is positive or negative for a clinically relevant protein, a number between 0 and 10 (or 0 and 100) is estimated, in order to later assess its significance in a specific situation or cancer type. This context-specific way of reading the test results could be analogue to indicating that the temperature of the water is 50 ˚C, which could be hot or cold depending on the particular case: For cooking, it would be considered cold but for swimming it would be hot. We believe Lunaphore’s Fast Fluidic Exchange (FFeX) technology has the potential to open the way to truly quantifying biomarker proteins on standard tumor sections. In order to do this, the proteins on the tissue sections are stained with other proteins attached to fluorescent antibody molecules (this is called “immunofluorescence”). Under the microscope we see how bright the tagged zone is by measuring its intensity. This number can be cross-checked with benchmark figures, just like we would compare the temperature of a water sample with the boiling and freezing point of water. What does our data suggest? The data uncovered in this study suggests that conventional test protocols do not provide a signal which truly correlates with the amount of biomarker protein expression on the tissue. 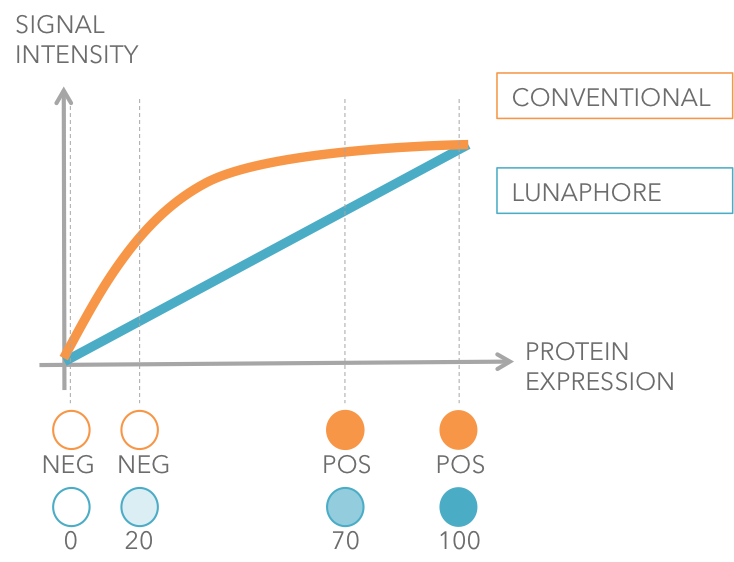 In fact, there is a large range of protein expression that cannot be differentiated by its intensity level. In our analogy with water temperature, this would be equivalent to a thermometer which would indicate 90°C for a range from 80°C to 100°C, therefore, different tumors samples appear to be expressing a similar amount of protein levels. On the contrary, when we use our technology to carry out the same test, we were able to obtain a nuanced signal that allows us to observe the differences. What could this change in the near future ? Personalized precision medicine relies largely on the information gathered by testing for specific biomarkers on tissue sections. The data extracted from our research suggests that conventional tests may be masking clinically relevant protein biomarker information in the millions of tests that are carried out worldwide every year. The expansion of our technique and the integration of quantitative information in routine diagnostic workflows may signify a major leap towards the concretization of precision medicine. Such quantitative data could potentially uncover correlations that have long been hidden and increase the success of treatment response, cancer prediction and prognosis.